More than a month after Hurricane Maria devastated Puerto Rico, nearly 80 percent of the island remains without power, and food and water can be tough to find. As we rally to help the survivors and look to rebuild, we owe it to the victims there and in hurricane-ravaged Texas, Florida and elsewhere in the Caribbean to build more resilient infrastructure and prevent and reduce such destruction. 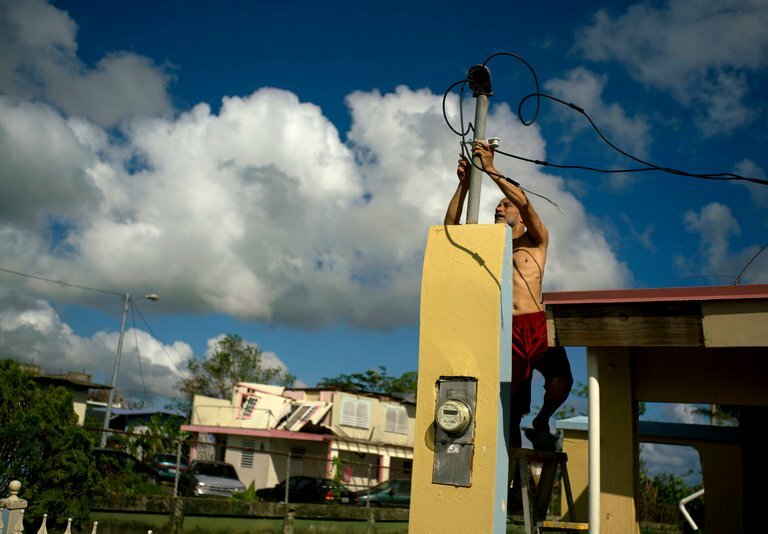 Rebuilding the electric grid in Puerto Rico will take months. But blackouts requiring weeks or months to fix are not caused by hurricanes alone. When one of us (Richard Branson) emerged from his cellar after riding out Hurricane Irma’s assault on Necker Island, the ground and everything surrounding it was destroyed – except for the solar power array, which laid flat on the ground and remained materially intact. Solar power systems survived Irma and kept working in Florida and Haiti. But that does not mean people with their own solar panels or other renewable energy systems managed to keep on their electricity. Though most of those systems were operable immediately after and often during the storm, they couldn’t produce a watt of power. Outdated utility rules disabled them, not high winds. Utility rules required that solar systems tied to the grid be shut down to guard against voltage surges that could endanger repairmen fixing the power lines. Homes that should never have lost power, or should have recovered it immediately, waited weeks for grid repairs they didn’t need. But modern power electronics have resolved utilities’ legitimate safety concerns. Inverters that can separate solar systems from the main grid can be installed, automatically or manually, and allow the solar systems to continue operating even though the grid is down. Unfortunately, nearly all utilities forbid this. In fact, Florida Power and Light lobbied the Legislature hard this year to restrict their customers from access to home-based solar systems when the grid goes down. We should use this opportunity in Puerto Rico and other places hit hard by recent storms to do two things: Rebuild damaged or destroyed homes and businesses to be energy efficient as possible, and rebuild the grid so that alternative energy systems like solar and wind, whether on a home or in a microgrid, can operate independently when the larger grid is damaged or shut down. With those storms behind us, we must work to rebuild stronger, fuel-free, stormproof power systems based on decentralized and resilient renewables like solar. We need to use 21st century innovation, not 20th century technology. Importing fossil fuels costs these island nations enormous sums. Yet the sun shines and the wind blows on these islands for free. Richard Branson is the founder of the Virgin Group. Amory B. Lovins is a co-founder of the Rocky Mountain Institute where he is chief scientist. We believe in the power of the sun and all the benefits solar can provide to our customers and the environment. We strive to be an industry leader in our practices, methods an product placement. We place the highest priority on working together as a team to provide our customers with exceptional service due to our consistency, ethical standards and actions. We aim to be admired for the best service, informed communication, quick turn-around times, and expertly installed quality products. We are committed to excellence in everything we do and strive to continuously improve. We are passionate about achieving results that exceed our customers' expectations and save our customers money for years to come on their electric bills. We are committed to our team and provide a workplace where growth and development opportunities are available .